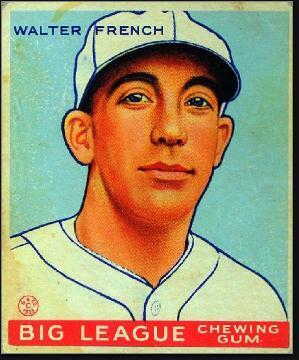 Walter E. French was born July 10, 1899 in Moorestown. The son of a construction company owner, Walt was a small, muscular athlete who starred in the three major sports plus track for Moorestown High. His best sport but was football but his blinding speed was what everyone noticed. In 1915, Walt and schoolmate Al LeConey—who would win a gold medal as a sprinter at the 1924 Olympics—led Moorestown to victory at the Penn Relays. The following year, Walt transferred to what is now The Pennington School in order to sharpen his football skills. Walt enrolled at Rutgers and became one of the school’s top all-around athletes. As World War I drew to a close, he was recruited by the United State Military Academy. In 1920, he was one of the leading running backs in the nation. That season, he and George Gipp had an epic showdown in the Army-Notre Dame game. Walt tore off several long runs and did the kicking for Army as the Cadets took a 17–13 lead at the half. The Irish slowed him down in the second half and won 27–17. Army finished the year 7–2 with five wins coming by shutout—including a 90–0 dismantling of Bowdoin. At season’s end, Walt was named to several All-American first and second teams. Army’s baseball coach, Hans Lobert, talked Walt into joining his group in the spring of 1921. Lobert had been baseball’s speediest player and he believed he could turn Walt into a major leaguer. He tutored him in hitting and fielding and he became one of the club’s top players. The following fall, Walt struggled to play football and keep his grades up, and was asked to leave West Point. Unsure of his next move, Walt was pleased to receive an offer from the Philadelphia A’s in 1922. He made the big club after just two years in the minors. Walt was one of the fastest players in the AL from home to first base. He had learned slap the ball and use his speed to hit .300. In 1925, he batted .370 and was baseball’s best pinch-hitter. Manager Connie Mack anointed him the everyday right fielder for 1926. In the fall of 1925, Waltand A's teammate Charlie Berry joined the Pottsville Maroons as a backup to star running back Tony Latone. In a crucial December game against the first-place Chicago Cardinals, Walt replaced Latone and had a game for the ages, including a spectacular 30-yard touchdown run on the frozen turf of Comiskey Park. The Maroons won 21–7. A week later, the Maroons upset Notre Dame in an exhibition game. The NFL kicked the Maroons out of the league, costing them the league championship. Walt was a regular for the A’s in 1926, hitting over .300. In 1927, the A’s acquired Ty Cobb, and Walt was relegated to backup duty for the first few months of the season. Mack reinserted Walt in the second half and he was the team’s best hitter, finishing over .300 again. Alas, that was Walt’s final stint as a regular. The game was changing and slugging needed to be part of an outfielder’s resume. He sat for much of 1928 and 1929, as the A’s put together one of history’s hardest-hitting lineups. Walt played in the minors starting in 1930 and enjoyed four excellent seasons. In 1933 he led the Southern League with a .351 average and was named MVP by The Sporting News. He was one of the rare minor leaguers that year to have a baseball card issued by the Goudey Gum Company. In 1937, Walt retired as a player and took a job at West Point as head baseball coach and assistant football coach. During World War II, he took time away from baseball and served as an Army Air Corps intelligence officer. After the war he opted to stay in the military and retired in 1959 to Southern California at the age of 60. He took up golf and mastered the game, shooting his age at 79 and again at 80. He passed away in 1984 at the age of 84.